On a small island off the west coast of Scotland, they’re bringing new meaning to the phrase ‘the beautiful game’. 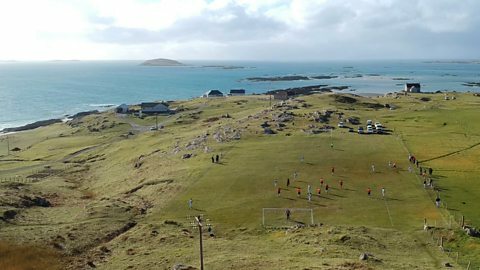 Despite a population of fewer than 150, the stunning island of Eriskay in the Outer Hebrides has a dedicated football club with its own pitch — but one that would make most ground staff wake up in a cold sweat. “It’s hard to play football on Eriskay,” says player-manager, Sean MacKinnon, “because the conditions aren’t always ideal. It’s wild, it’s remote and the pitch is small and bumpy. The pitch was recognised by Fifa as one of the eight most remarkable places to play football in the world. The organisation also shot a film about it for their football museum in Zurich. It’s pretty much ‘If you’re from Eriskay, you play for Eriskay’. Sean MacKinnon, player and manager of Eriskay FC doesn’t have to look far for advice as many of the team’s previous managers are still on the island and continue to play for the team. One example is Cherry MacAulay, who takes a dim view of anyone complaining about the state of their pitch. Visited by Scottish football show A View From the Terrace, the players can be seen shouting and passing the ball with the usual fervour as mythical-looking white ponies scamper nearby and hazy mountains form a bold backdrop. We want to play five-a-side on these amazing pitches? Is there a power shift away from wealthy ex-players and towards the fans? No Ball Games signs – the scourge of childhood football dreams. How can you turn your patch of grass into Hampden, when the council say no ball games? What’s it really like inside a dressing room on matchday? How does a football team prepare and how does a manager lead his team? Revealing all behind the door of the Airdrieonians FC dressing room. What happens when football gets in the way of real life? Rachael Small of Hibs ladies and Scotland, on football, having a child and how that impacted her world cup ambitions.